Full written and charted instructions as well as photo tutorial. The Pecan Pie Wrap showcases the striking colour changes of a Scheepjes Whirl. The colour changes travel from side to side on a diagonal to create a real show stopper of a piece with a visually stunning pattern. 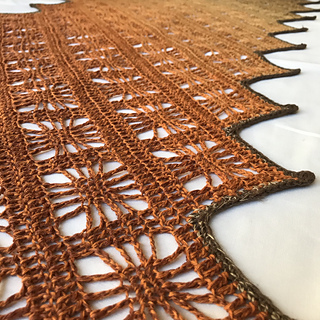 Not only is the wrap worked on a diagonal, but it also has the pointy edging, giving this rectangle wrap something a little different. 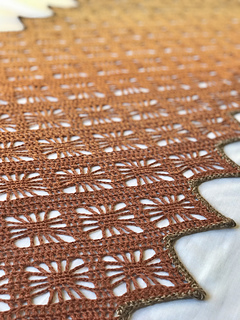 Simple stitches are used, such as; tr (US dc), dtr (US tr), dc (US sc), and the pattern includes full and detailed written instructions as well as a chart and a schematic to detail the shape and simple construction. There is a photo tutorial included within the pattern to show how to increase stitches where needed. I think the pattern is detailed enough that even a beginner could follow it. 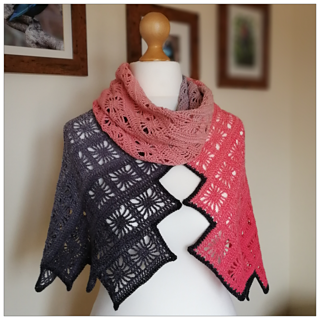 I love the effect of this pattern when a colour changing yarn is used but equally, this would look great in a plain colour, or you could use it as a stashbuster project. You could also experiment with different yarn weights, such as DK for a snuggly cosy wrap. I hope you enjoy making this pattern as much as I’ve enjoyed designing it.